Nov. 2, 2017 6:00 p.m. 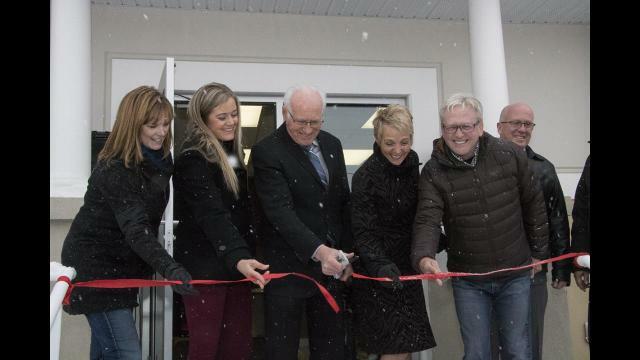 The Central Alberta Pregnancy Care Centre (CAPCC) held a ribbon cutting ceremony for Phase II of their facility Thursday afternoon. CAPCC then began construction Phase I of their facility which includes four bedrooms with private bathrooms and a communal living space with a living room and kitchen. Four clients could live with their infant and learn different life skills including parenting. Mothers in Phase I can stay and live in the facility until their child is around six months old. Phase II of CAPCC consists of seven one-bedroom apartments that helps young mothers transition to more independent living, while still living underneath the house guidelines. Mothers can learn different skills in Phase II that can help them finish high school, go to college, learn a trade and also to overcome difficult circumstances like addiction and mental health trauma. From their facility, CAPCC offers programs on adoption, post abortion counselling, parenting, prenatal education, Steps to Sexual Health, unplanned pregnancies and they also have male volunteers who offer counselling to young men and fathers who have partners who are pregnant. Waddell said the program initially was designed for young, vulnerable women – however that quickly changed due to need. “We used to think we were just for young girls who have found themselves pregnant, but the most at-risk are generally 19-25 college aged women,” she said. “Women of all ages can come access our services from 12- to 60-70 year old women. She added CAPCC currently offers services Red Deer, Olds, Rocky Mountain House and Sundre and their ultimate goal is to be available in every community. The ribbon cutting ceremony, CAPCC held their annual fundraising banquet with the hope of raising $100,00 towards their operating budget. The capital cost of their facility is $3.1 million, with about 70% of that raised so far. “It is an evening we can say thank you to our donors—we have over 500 people there tonight and they will be able to hear from clients and the impact they have made,” Waddell said.